We went cycling with Hayley and Ross to Kuthodaw Paya. This is the biggest book of the world. However, we didn’t find it for a while, and kept searching for it, while it was right under our nose, but not in the way we imagined it. 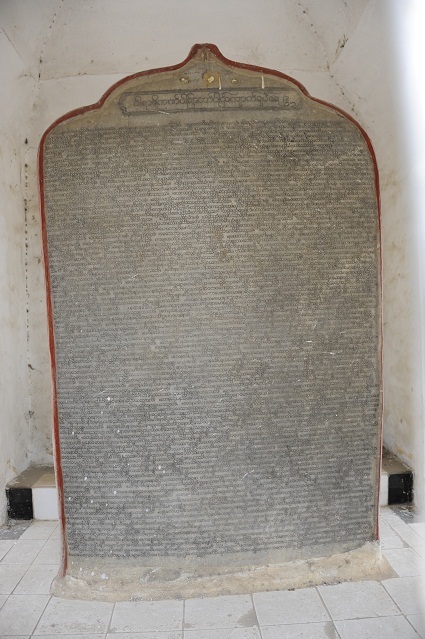 Here is one of its pages, a big stone carved on its 2 sides. Each “page” is under a little white stupa. 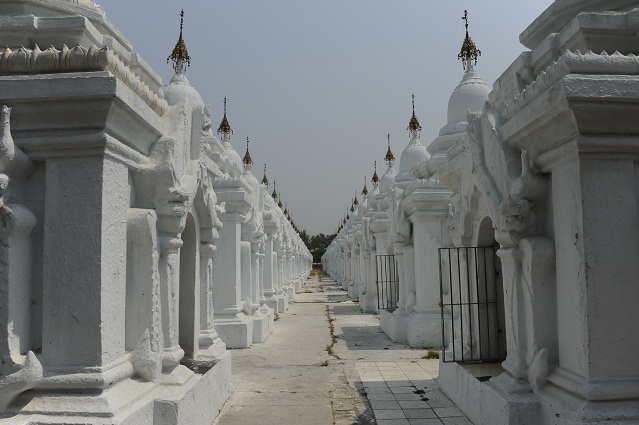 There are 729 stupas in the paya, which each a page of the 15 books of the Tripitaka, making it the biggest book of the world. Funny! After that, we went to see the commentaries pages of the book. Same idea. 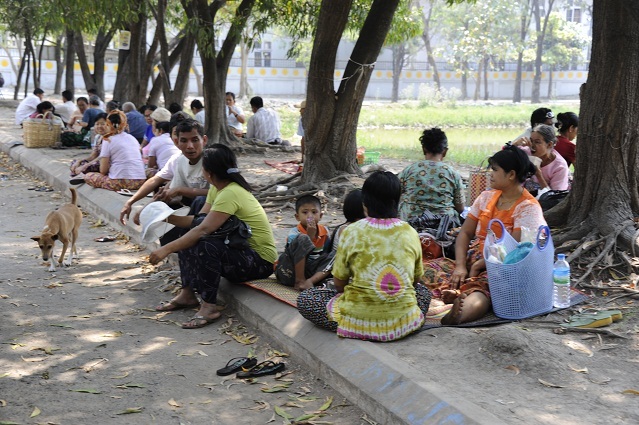 Between the book and the commentaries payas, there were some trees under which shadow people were chilling out and having some lunch. Then we walked nearby and saw 2 other buildings from outside, and had some lunch near the Mandalay Hill. After that, we saw the Kyauktawgyi Paya. 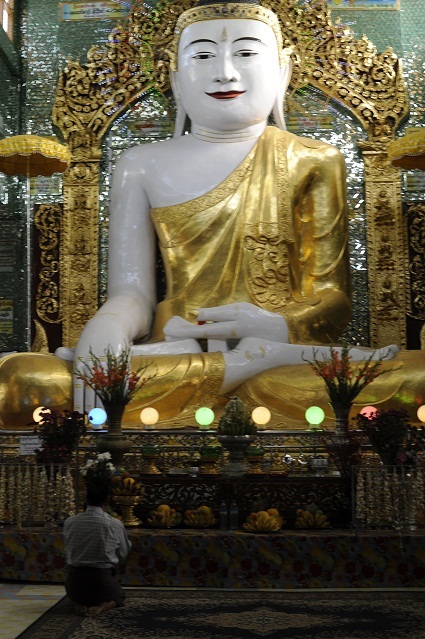 Inside was a 900-tonne Buddha dressed in royal attire and carved from a single block of marble. Apparently, it took 10,000 men and 13 days to transport it from a canal to this present site in 1865. 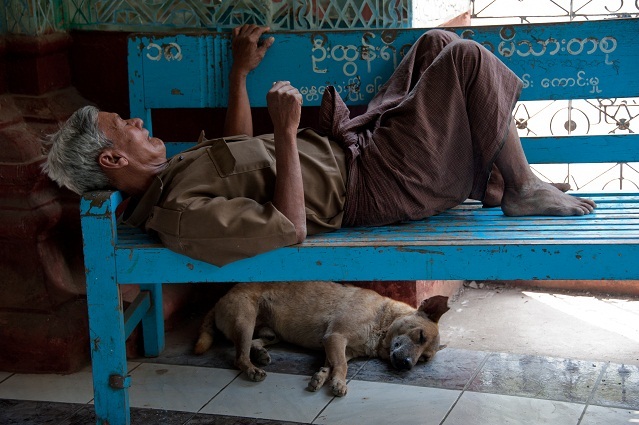 Around the temple was a shaded walkway under which many people were having a nap on benches, as much men as dogs. After that, we quickly saw the Peshawar relics. It was a very small museum, in which monks were cooling and reading the newspapers. 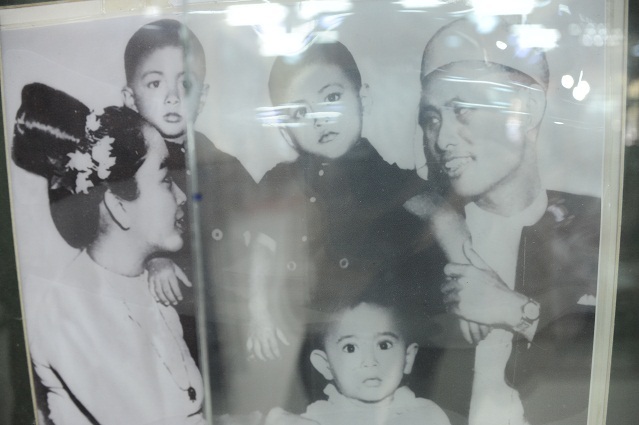 They had one interesting picture in it of Ang San Suu Kyi with her family when she was a little girl. 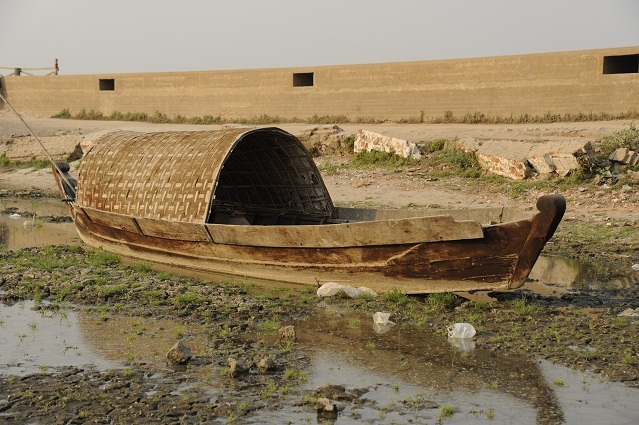 We cycled to the river and on our way we saw men making walls with raten wood. 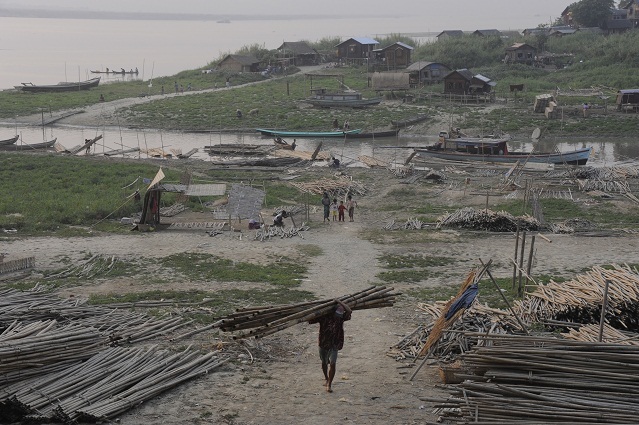 There are a lot of houses with this wood cover in Burma. 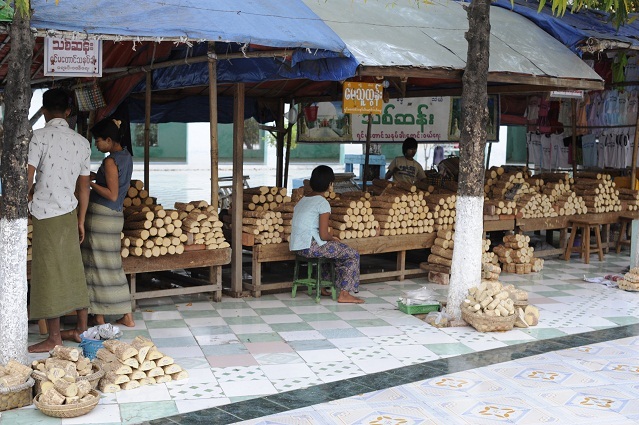 We discovered by chance the most beautiful thing I saw in Mandalay, an authentic village, where the inhabitants were specialised in garlic! 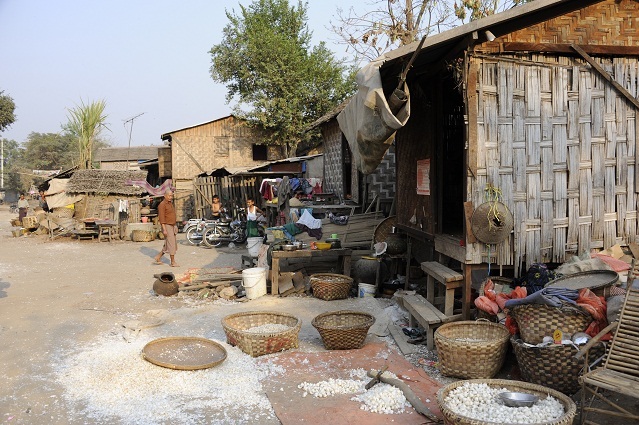 While garlic smell usually evokes a strong heavy smelly smell, the smell in the village was actually lovely. The women were separating the garlic from its envelop. Somehow the end result was potato chips naturally made with a slight taste of garlic that they were then loading on bikes to go sell them. We were there right at the time of the golden light, and it was a perfect place and time for photography, Michael and I enjoyed photographying it really much. Just behind the little hill was the river, actually a small river going to the real biggest river. Here was the real Mandalay, the authentic one we were eager to see since we had arrived, the one with ox carts still going around and life as 2,000 years ago going on. It was an incredible excitement and beauty to catch for us photographers at the greatest time of the day, the sunset golden light time. People living there, fishermen, beautiful boats like this one. Women walking around carrying on their head really huge baskets. 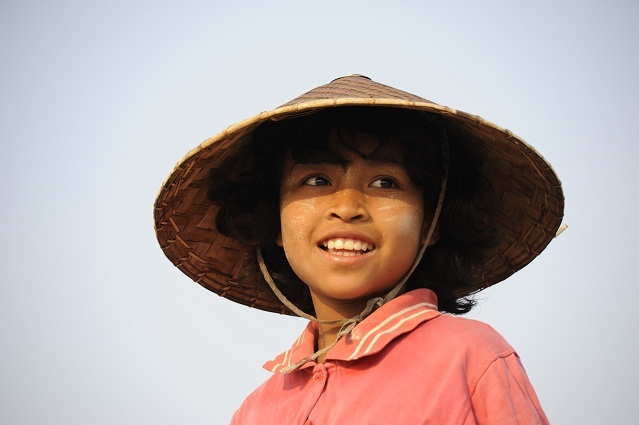 Beautiful portraits of smiles of Burma. I went down and walked around near the water and saw this family washing. There was also these 2 women, one combing the hair of the other. And other women doing some laundry. 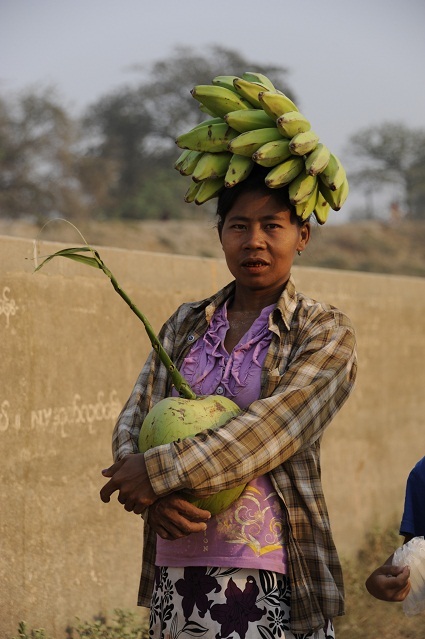 And one carrying a coconut, with bananas on her head. New fashion style! We kept cycling further. This river was gorgeous and there were lots of people living near it. We arrived at a point where people specialised in bamboo carving. It really felt like being back a few hundred years ago when looking at this photo. We kept cycling and found a nice pub with a view over the river where we had some beers. Here is the view we had from there. We cycled back and went to Nay again, the Indian street food restaurant next to our hotel. We had planned a second day of cycling together the four of us, but Hayley and Ross were sick, so they stayed in bed all day. I had got sick during the night too, but felt enough good to go somewhere. 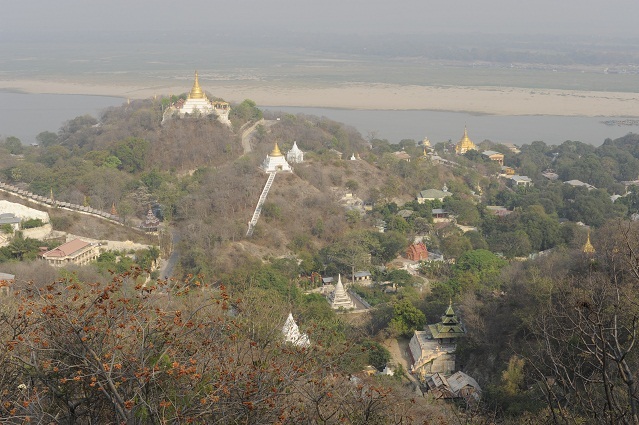 With Michael, we took a local bus to Sagaing, a nearby village of Mandalay. In the local bus, there was a guy who was holding an orchid under a plastic bag. He told us it was an ornament for the hair of his wife for a special occasion, and had cost him 3,500 kyats which is about 4.5 dollars, that’s a lot of money for here! There was also a gay guy on board who was really really funny. He spoke good English and knew a few words in many languages. It was cool to chat with him. This local Toyota kept dropping people and taking new ones. It is a 2-men team each time, and the guy helping the driver out works almost harder than him, by shouting to the street where the bus is going, helping people to get off, collecting the money, helping people to get in, keeping an eye on everything for the ride to be quick, efficient and smooth. Fascinating. We were dropped at the start of Sagaing and stopped first for some Star coke, the local coke, which taste is actually not too bad. Then we started walking, but 2 motorbikes kept telling us gently that “Look, guys, Sagaing Hill is far, why not let us take you there?”. At the beginning, we really kept replying “Naaa…Foot power, foot power!”, keeping walking and pointing towards our feet. But then, when the hill was in sight, they showed it to us and we realised that it was quite far, so we accepted their motorbike help and actually one guy took the 2 of us there, while the other one went off. 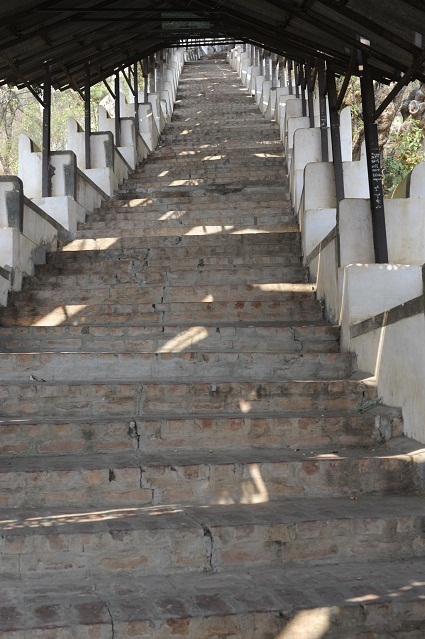 We started climbing the Sagaing Hill, same concept as the Mandalay Hill, a long range of stairs under cover. 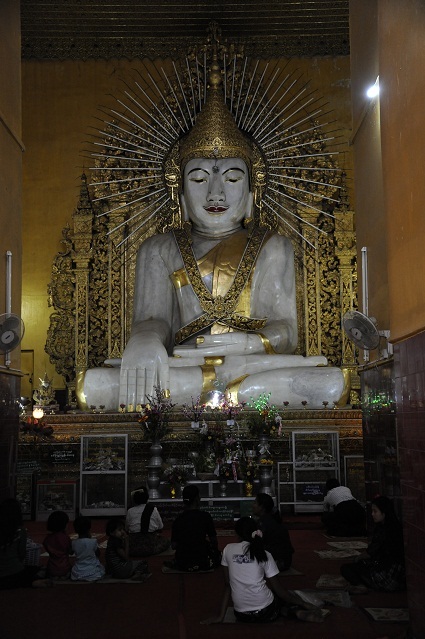 We saw the Buddha at the top in the Soon U Ponya Shin Paya. 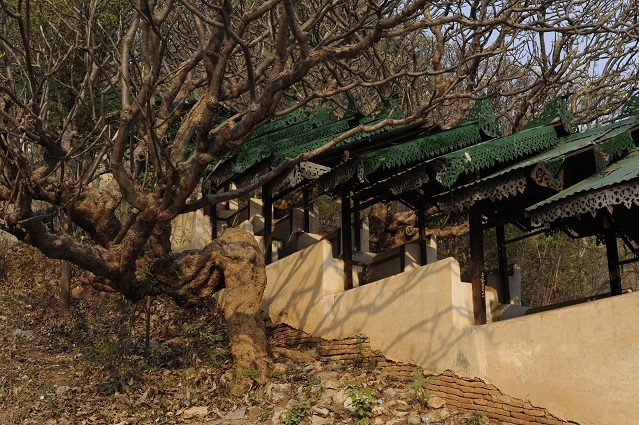 “Legend claims that the structure magically appeared overnight, built by the king’s faithful minister Ponya in a superhuman flurry of activity inspired by a magical Buddha relic that he had found in a betel-nut box. 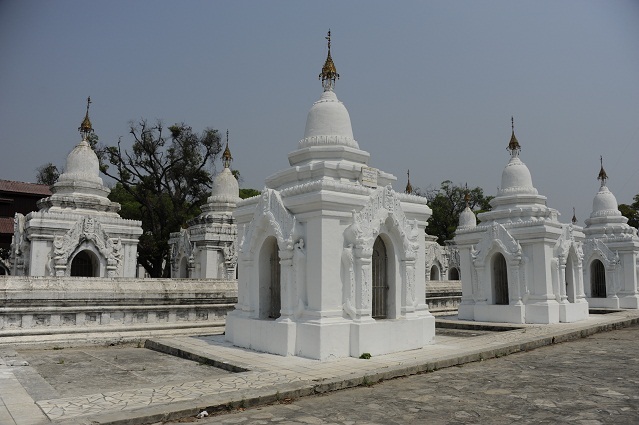 The myth fancifully claims that Ponya himself was of supernatural parentage, his father having “flown” to Sagaing from the Himalayas millennia before, arriving to a curious communion with the Buddha, seven hermits and a flower-bearing orang-utan.” And the Lonely Planet to add “Burmese genealogy is never boring”. Ahah. Indeed. Nevertheless, the place was magic and you could see many many pagodas from the hill. An incredible place, fully Buddhist and spiritual again. I caught that photo I really like. As for us, we did have time, so we went slowly slowly down, taking lots more photos. 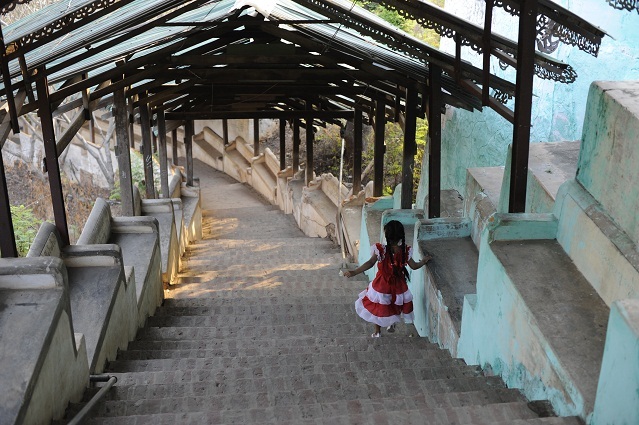 Here is one of how the stairs structure looks from the side, with its frangipanier trees in flowers. 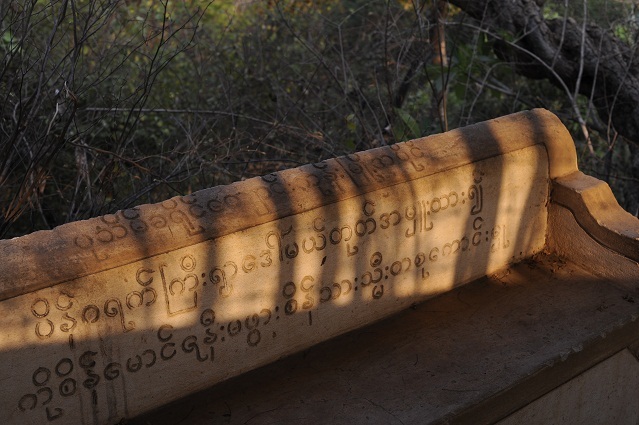 The benches all the way near the stairs are marked with Burmese scriptures. 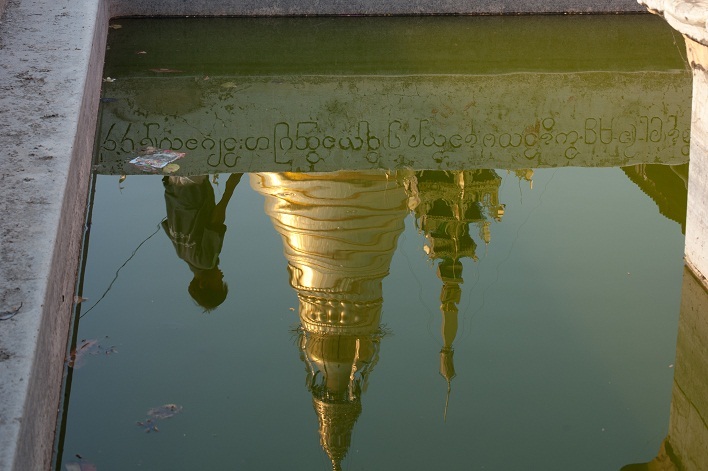 After getting down the Sagaing Hill, we wanted to go to see the Kaungghmudaw Paya. One pick-up guy took us there, and it was quite away. We passed local villages, and also some forgotten stupas that were old bricks ones and really nice, that the Lonely Planet book didn’t mention. 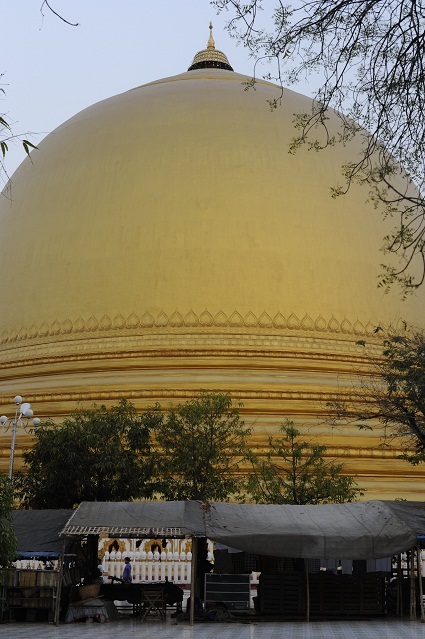 We walked around this beautiful stupa, and it was great to be the only tourists there. 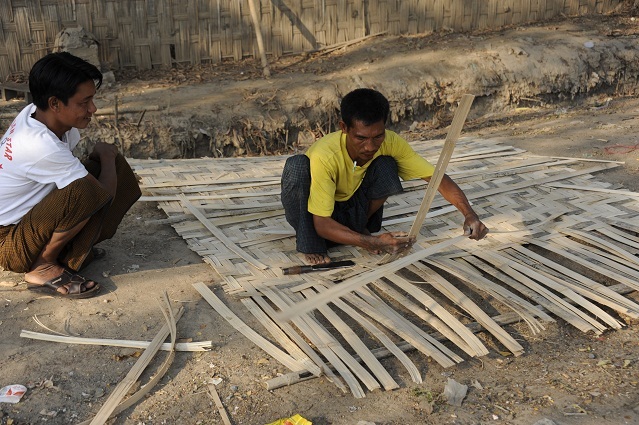 There were a lot of people selling the wood used to make the thanakha. The pick-up driver took us back to the spot where we wanted to take the local bus back to Mandalay, but it was dusk already and people told us there were no local buses anymore to Mandalay. We didn’t want to pay an expensive taxi or motorbike taxi, as it was about an hour ride from Mandalay. So we raised our thumb up and hitch-hiked. We were lucky, one minute after one young guy in a four-wheel car stopped and asked us where we were going. He wasn’t going to Mandalay but called a friend of him who was. He took us to a round-about and then we transferred to his friend’s car and she and her friend took us to Mandalay, for free, and were very friendly and educated and fun. 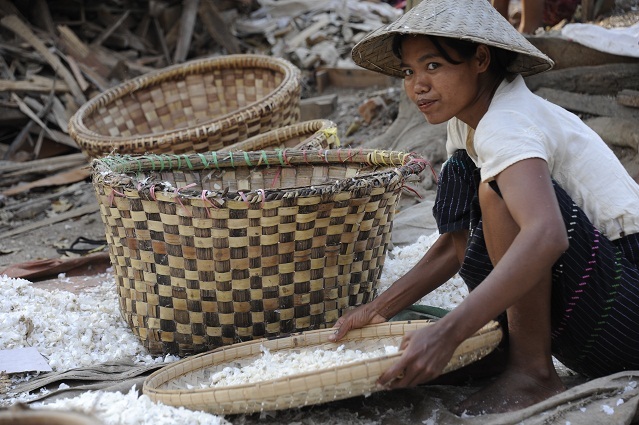 They actually were from Yunnan, China, but had been living in Mandalay for a long time. 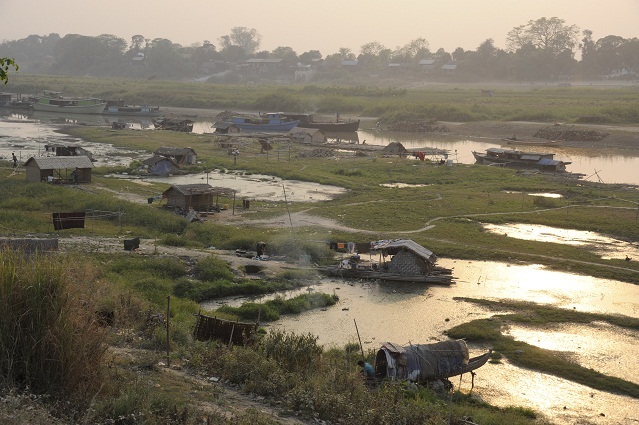 So in no time we were back in Mandalay, at our hotel, when we felt like stranded in Sagaing just before. 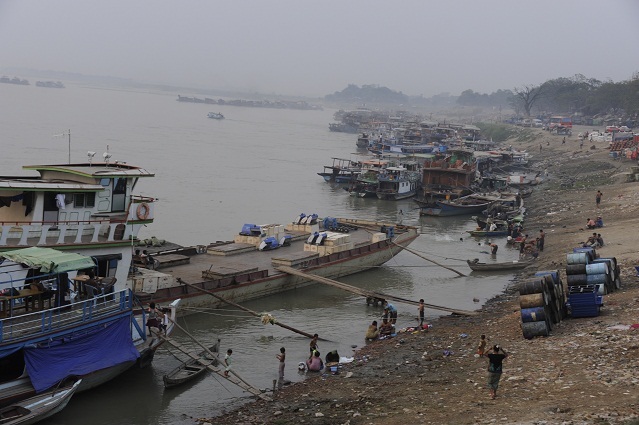 Long life to hitch-hiking Burma. We went to check on Hayley and Ross who felt a bit better, and asked for our bus tickets for the next day. We had asked to take the 6am bus, but it was full, and we got tickets for the 2.30pm bus. We actually felt really happy about that! My stomach was still messed up, and we were tired of the long day, so that was perfect! We went for dinner. I was desperately looking for a soup, but there was only Indian street food around, so we finally just got some chapatti bread for dinner. Tomorrow morning, bus to Hsipaw, let’s go a bit North!